Last year (how time flies!) I stumbled across a wonderful tutorial posted by Melanie Muenchinger, about creating a sketchbook look with stamps which set me off on a very enjoyable exploration of the monochrome, starting here. This week, with Stampin' Up Watercolor Pencils in hand, I decided to revisit the monochrome using the Basic Gray, Basic Black and Whisper White pencils without any water. I found the bow, ready made, on my desk. It must have been there for a while as the ribbon is now retired! The flowers on the background piece are clear heat embossed and then very lightly coloured with the Basic Gray pencil. 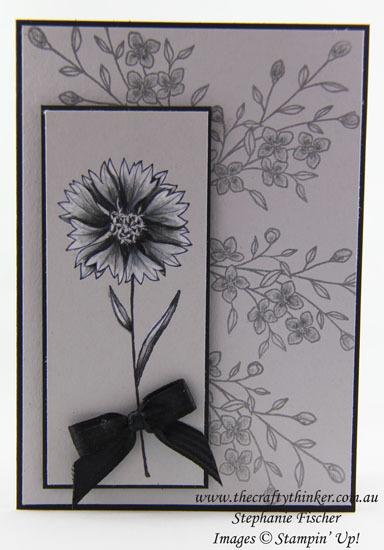 The focal flower is stamped with Basic Black ink and then coloured with all three pencils. Although the pencils are soft, the overall look is crisp because of the contrast of the black ink against the Smoky Slate card. The top panel is raised up Stampin' Dimensionals. While my head was in this space - I also stamped a flower using Smoky Slate ink which produced a very different effect that I'll share with you on Friday.